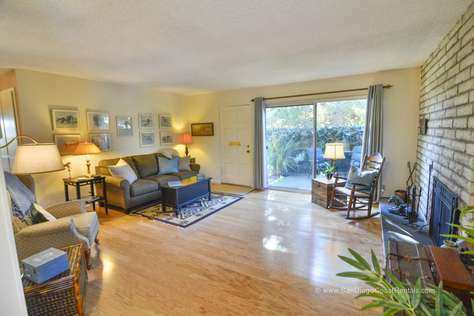 Beautifully decorated 2 bedroom 1 bath condo, walking distance to the Del Mar Thoroughbred Race Course and beach. Enjoy sweeping valley views from the back patio area or walk across the street to the pool complex, complete with green belt and panoramic ocean views. Property owned by a long time horse racing family and tastefully decorated with race inspired art, new furnishings and vintage touches. The perfect retreat for race enthusiasts, this unit is located in a quiet neighborhood outside of the hustle and bustle of the beachside communities but coveniently close to everything Del Mar.